To make the chia mix, place the chia seeds, almond milk, cinnamon, vanilla paste and yoghurt into a bowl and whisk to combine. Spoon into two pots (you can use jars if you don’t have a suitable pot) and leave in the fridge for at least one hour (or up to 12 hours) to allow the chia to swell and absorb the liquid. When your chia mix is ready, place the banana, blackberries, cinnamon and remaining almond milk into a blender and whizz until smooth. 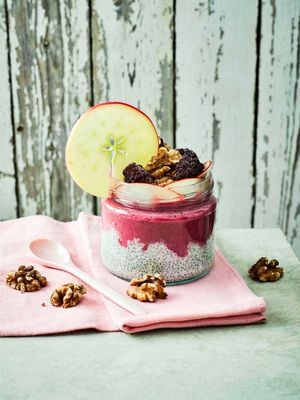 Pour the smoothie mixture on top of the chia, then decorate each pot with the California walnuts, thinly sliced apple and reserved blackberries.